Altocumulus radiatus are specific types of clouds which are important for a number of reasons. For instance, the altocumulus radiatus are very important in the aviation industry, as they normally cause frosting on the wings and other parts of planes. This can be ascribed to the fact that the altocumulus radiatus clouds normally contain a large amount of moisture in the form of ice, water or snow. Since they are middle clouds (they occur between 6,000 and 16,000 feet above sea level) they are directly in the path of such planes, so one always needs to know their characteristics. What height are altocumulus radiatus clouds found? Altocumulus radiatus clouds usually form at an altitude of around six to sixteen thousand feet above sea level. In terms of clouds, this height is considered to be average for clouds, and this is why these clouds are termed to be middle level clouds. Though this altitude may not be as high as the cruising altitude of some aircraft, the altocumulus radiatus clouds still pose a risk to aviation due to the fact that they may contain significant amounts of ice and crystals. These clouds, based on the height at which they are formed, can be classified as middle level clouds. How are altocumulus radiatus clouds formed? These types of clouds, as with all other types of clouds, are formed when air containing some moisture is forced to move upward to the upper reaches of the atmosphere. Here, the cold air forces the liquid within the air to condense, forming tiny particles that makeup the clouds. Usually, the size of the particles in the clouds will give the clouds their characteristics. • Tiny droplets of water or ice within the clouds normally disperse light a lot. This means that the clouds with tiny droplets will look dark. • Clouds that have larger droplets will permit more light to pass through them. For this reason, the altocumulus radiatus clouds with bigger droplets will look whiter than those with smaller droplets. One thing that has to be stressed is that the formation of the clouds in the case of altocumulus radiatus clouds has to be in the region of 6000 to 16000 feet, so the water content carried by the air has to be just right for the altocumulus radiatus clouds to form. What do altocumulus radiatus clouds look like? As the name would suggest, altocumulus radiates clouds usually have a main body from which wisps of cloud radiate. These clouds can come in either white or grey, but majority of the time they are white in color. How common are altocumulus radiatus clouds? As far as clouds go, altocumulus radiatus clouds happen to be very common. You can easily catch them multiple times in one day. If you live in an area that normally has cold air fronts coming in and meeting fronts such as from a lake or ocean, you will find that altocumulus radiatus clouds form and can be seen easily. Where can I see altocumulus radiatus clouds? 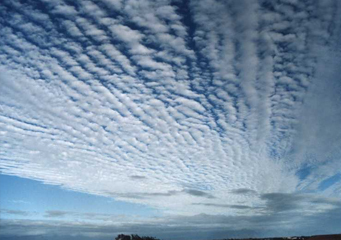 Most of the times, altocumulus radiates clouds can be seen in temperate zones.